One of my greatest weaknesses is that I often don’t finish what I start. This deficiency has led to an attitude where sometimes I refuse to tackle a project because I know I won’t see it through to completion. So in marking my four-year blogiversary, I’m celebrating a rare consistency that inspires me to be more reliable in other areas of my life! 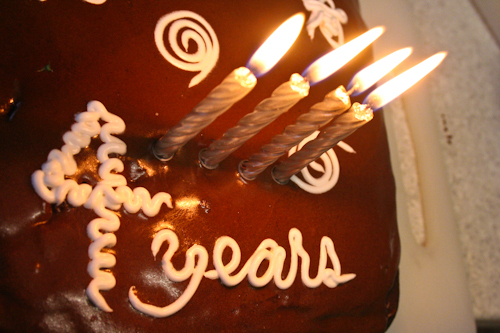 We marked my blogiversary with a chocolate cake and candles! I originally started blogging because we needed to announce Brioni’s name change and I had a really cute photo of her and David that I wanted to show everyone, and a blog seemed like a good way of sharing it. Over time, the blog has grown into so much more, and I’ve loved maintaining a record of our girls’ lives as well as keeping my mummified mind sharp through writing, photography and design. I have a terrible memory, and writing things down embeds them in my mind. And if I forget about something, I can always look it up on the blog! Calista loved blowing out the candles. I re-lit them for her because she enjoyed it so much. I hope that in the future, the girls will enjoy looking back at this record of their lives. I hope they will see that we have parented very deliberately, choosing to pursue a path less travelled rather than just stumbling down life’s road and dragging them along with us. And as for me, I hope that these four years of consistency will lead to another four years of blogging. I pray that I will demonstrate consistency in more areas of my life, and I will be transformed into a more reliable person. So if you’re a regular reader, enjoy! There’s more coming, and we love to share our lives with you! Yay! Congratulations on 4 yrs ;) I love reading your blog and can’t wait to see it grow even more! Celebrating consistency with you Lauren! So thankful you were persistent and stuck with the writing and sharing process. May you continue celebrating life for many years to come. Happy Blogiversary!!!! I think it’s wonderfully cool that you’ll have this awesome record of your girls’ lives. Happy days! Wow 4 years. 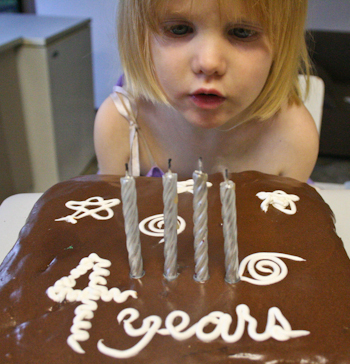 As a blogging novice of 4 months, 4 years sounds like a long time, what an achievement. Please keep writing we enjoy your journey and it sounds like it keeps your on track also.